DEALER TRENDS: 80 • RV PRO • November 2018 rv-pro.com D E A L E R S By Lisa Dicksteen Often, the focus for dealerships is on RV sales. Still, without a quality parts department, many dealerships would be leaving a lot of money on the table. How has the past year been for those parts departments? Have there been any major shake-ups in terms of what they are carrying? And what impact is Amazon and Camping World having upon dealerships sales departments? RV PRO asked dealers across the country what's been going on. 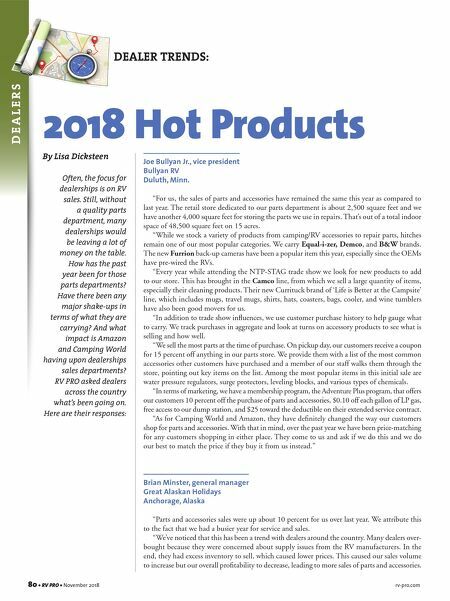 Here are their responses: 2018 Hot Products Joe Bullyan Jr., vice president Bullyan RV Duluth, Minn. "For us, the sales of parts and accessories have remained the same this year as compared to last year. The retail store dedicated to our parts department is about 2,500 square feet and we have another 4,000 square feet for storing the parts we use in repairs. That's out of a total indoor space of 48,500 square feet on 15 acres. "While we stock a variety of products from camping/RV accessories to repair parts, hitches remain one of our most popular categories. We carry Equal-i-zer, Demco, and B&W brands. The new Furrion back-up cameras have been a popular item this year, especially since the OEMs have pre-wired the RVs. "Every year while attending the NTP-STAG trade show we look for new products to add to our store. This has brought in the Camco line, from which we sell a large quantity of items, especially their cleaning products. Their new Currituck brand of 'Life is Better at the Campsite' line, which includes mugs, travel mugs, shirts, hats, coasters, bags, cooler, and wine tumblers have also been good movers for us. "In addition to trade show influences, we use customer purchase history to help gauge what to carry. We track purchases in aggregate and look at turns on accessory products to see what is selling and how well. "We sell the most parts at the time of purchase. On pickup day, our customers receive a coupon for 15 percent off anything in our parts store. We provide them with a list of the most common accessories other customers have purchased and a member of our staff walks them through the store, pointing out key items on the list. Among the most popular items in this initial sale are water pressure regulators, surge protectors, leveling blocks, and various types of chemicals. "In terms of marketing, we have a membership program, the Adventure Plus program, that offers our customers 10 percent off the purchase of parts and accessories, $0.10 off each gallon of LP gas, free access to our dump station, and $25 toward the deductible on their extended service contract. 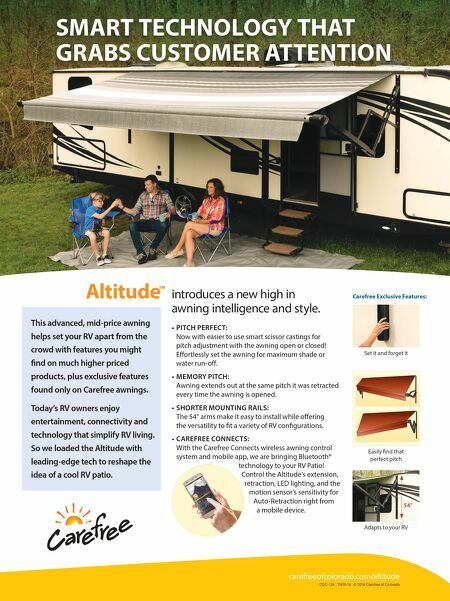 "As for Camping World and Amazon, they have definitely changed the way our customers shop for parts and accessories. With that in mind, over the past year we have been price-matching for any customers shopping in either place. They come to us and ask if we do this and we do our best to match the price if they buy it from us instead." Brian Minster, general manager Great Alaskan Holidays Anchorage, Alaska "Parts and accessories sales were up about 10 percent for us over last year. We attribute this to the fact that we had a busier year for service and sales. "We've noticed that this has been a trend with dealers around the country. Many dealers over- bought because they were concerned about supply issues from the RV manufacturers. In the end, they had excess inventory to sell, which caused lower prices. This caused our sales volume to increase but our overall profitability to decrease, leading to more sales of parts and accessories.